Ambling along the extensive trails at Glacier National Park on horseback is one of the best ways to see the vast wilderness area. 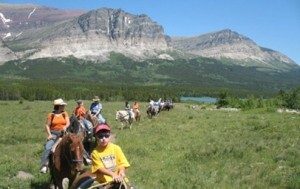 Swan Mountain Outfitters provides the unique opportunity to see Glacier by horse. 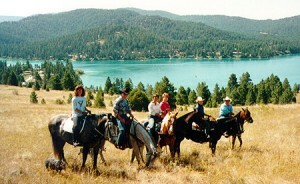 Get to hard to reach places, cover miles of terrain and see amazing views on a horseback riding tour here in Montana. There are a number of outfitters around the park that are ready, willing and able to make your Montana vacation the best it can be. This tourism company is now the officially sanctioned provider of trail rides in Glacier National Park. They have corrals operating in the Apgar, Lake McDonald and Many Glacier regions. Choose between trail rides that last from an hour to full-day excursions. Ride and pack services are provided to Sperry and Granite Chalets. Call (406) 888-5010 to make a reservation with Swan Mountain Outfitters. Explore the heart of Blackfoot Country with Glacier Gateway. This company gives tours along the western border of Glacier National Park. Their Native American guides will take you on excellent trails through spectacular mountain landscapes. Along the way you might even see moose, elk, deer or bears. Forget about cars, trucks, buses and gas stations- ride horseback! Call (406) 338-5560 for more information about Glacier Gateway Trail Rides. A High Country Trails tour with Flathead Lake in the background. This tour company will show you the backcountry of the Flathead National Forest. This area is not technically within Glacier National Park, but still boasts many gorgeous landscapes, sport activities and wildlife. One-hour, two-hour, half-day and full-day trail rides are available through Flying Eagle Ranch. Tour the scenic Flathead Valley with High Country Trails. Ride along trails with Flathead Lake below and the peaks of Glacier National Park in the distance. Wildflowers and wildlife are abundant in the area. Tours are offered as 1.5 hour to full-day excursions. An excellent choice would be the two-hour tour of their ranch with saddlebag lunch or their evening rides with an Old West steak cookout afterward. Private and group lessons are available. Call (406) 755-1283 to make a reservation.